The current lighthouse, erected in 1917, is an octagonal concrete structure surmounted by an aluminum lantern. The tower is painted white and the lantern red. 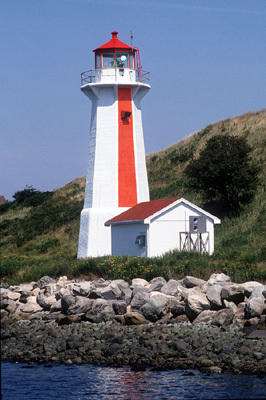 There is a fluorescent red vertical stripe as a daymark on the south side which faces the mouth of the harbour. The first lighthouse on Georges Island was established in 1876. It was located on the western shore, behind the house. The light was two fixed white lights, 20 feet apart vertically. The apparatus of the light in that year was catoptric reflector oil lamps. The structure was a 35 foot white square wooden tower, with a black diamond daymark on the south side, and a red iron lantern. There were various changes over the years to the light. In 1899 the fog bell from the Maughers Beach Lighthouse on McNabs Island was transferred to Georges Island. In 1903 the light was changed to one flashing red light 50 feet high. In 1916 the lighthouse was destroyed by fire. A temporary red occulting light was established. Early in January, the light was lit in a new concrete lighthouse of the same design as that built at Louisbourg in 1923. This is the lighthouse that stands on the island today. It is about 200 feet from the lightkeeper's house, which is still standing. The light was group occulting white until 1922 when a 4th order dioptric lens was installed. The light was flashing green until 1977. In 1973 a fluorescent red stripe was painted on the south side of the tower and in 1992 an electric lantern was installed. The concrete light on George's Island with the walls of Fort Charlotte behind it. Note the green light. Taken prior to 1977. The First Georges Island Lighthouse, Shows the consruction of the fort on the island. The light itself was in a little glassed chamber and you had to climb three ladders in order to reach it. The light was shining brass and copper, with a green cover and polished magnifying glass over the whole thing. It revolved by a spring which had to be hand wound everyday. The light had a mantle which operated on kerosene vapor, and burned from sunset to sunrise. In the fall and winter, when the nights are longer, the light had to be wound in the middle of the night or it would not run all night. In case of break down an emergency kerosene lamp was put up. On foggy days the fog alarm had to be set in motion. The characteristics of this 'Tyfon" was 2 blasts of 2 seconds duration every minute thus: blast 2 seconds--silent 28 seconds--blast 2 seconds--silent 28 seconds. The fog alarms were moved in the late 1950's from inside the bottom level of the lighthouse to a small house behind the lighthouse. They are still to be seen on the west side of the island. Four of the lighthouse keepers who were the longest on George's Island were Mr. Robert Ross, Paddy Nolan, Victor Matthews, who was my father, and Mr. David Barkhouse. Paddy Nolan and his wife were sole inhabitants from 1929 to 1942. After that the army moved in with an anti-aircraft battery in 1943. Paddy had to row to Pier 20, National Harbours Board to get his mall and other supplies. They did not have any electricity on the island when they were there. At a meeting one time Paddy said that "I wouldn't have wanted a better place to work and live. My father, Victor Matthews, worked there for 18 years. He moved there in November, 1946 with his wife Ethel Matthews, two sons, Leonard and Sherman and 2 daughters, Victoria and myself, baby Dale; the other daughter Alfredia was married to Art Hines and lived in Woodside. Our house was a small bungalow with only two bedrooms. We had an assistant lighthouse keeper who had his own bedroom. Don't ask me where we slept! Some of us had to sleep with each other. We did not have any electricity on the island so we had a wood/coal stove in the kitchen and a floor furnace in the hallway. My mother, Ethel, had to use a battery operated washing machine, and a battery was used in the radio, too. The irons had to be heated on the stove when we were ironing. We had ship to shore phone with the radio station, and had to call them every night. There were two wells on the island for our use. The well by the house was used for the bathroom. The other well, out further, was used for drinking water. The water for the bathroom had to be pumped through a pipe in the kitchen to a holder up in the attic. What a nuisance! We had a little bit of luxury, and that was my father Victor's boats. He had the second fastest boat in Halifax Harbour. Ethel was known as the best Captain (showoff) of that boat. Dad had two other boats, a punt, and my brother, Leonard had a small outboard boat. We also had a big dory. I did have problems going to school. Sometimes Dad would drop me off at pier 20, National Harbours Board; or Kings Wharf. One day in the winter he went down to get the boat and a log in the Harbour hit the stern of the boat and holed it. The stern of the boat sank and the bow was pointing upward. That was the first time that ever happened to us. From Grade 6 on I had to board in Halifax. I lived at the South end, the North end, and in-between. In 1960 I lived with my sister, Alfredia in South Woodside. When we lived on George's Island, we had hens, chickens, and beautiful white rabbits. One time my father, Victor, had a visitor up in the island's citadel. It was a deer that swam to the island and he fed it. Victor was the deer's friend, but it left in a few days. Another deer that swam to the island fell into the moat and could not get out. We had to call the police through our radio station and get permission to take it's life. My brother, Sherman shot the dear and we had to get it out of there. We were not allowed to eat It. The island, located in Halifax Harbour, was called "Ile a la Raquette" by the French. It was briefly renamed "Ile d'Enville" when the unfortunate Duc D'Anville he was buried there in 1746, before his body was dug up and moved to Louisbourg. 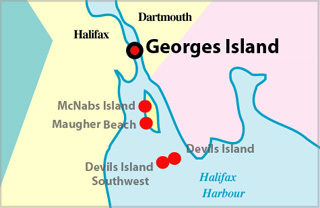 In 1749 when Halifax was founded by Colonel Edward Cornwallis, it was called George Island, after King George II. In 1963, the name was changed to George's Island. Tower Height: 021ft feet high. Structure Type: Octagonal concrete tower, white, red lantern. In 1973, vertical red strip painted on south side. Halifax Harbour Range Lights Front. Tower Height: 052ft feet high.